After nearly two decades, business partners Randy Enwright and Jim Rimes decided change is good. 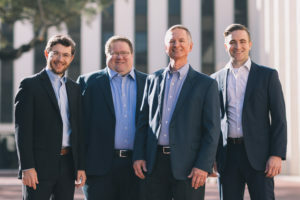 Enwright Consulting Group is changing its name to Enwright Rimes Consulting, to better reflect the longtime business relationship of the two men. A sister company that provides political services — EM Campaigns, in business since 2003 — also is switching names to Election Management Solutions. Clay Barker, who joined the firm in 2016, will take on a leading role as Project Manager and Consultant. And they’re launching a brand-new company called Supernova Digital Communications, a full-service digital shop that can design digital ad campaigns, manage social media, help with email marketing and build websites. Zach Monahan has come on board to manage it. These evolutions are as natural as the bond that kick-started their partnership, Rimes says. They’re both St. Petersburg natives who connected because their relatives were on the St. Pete High football team in the 1940s, he explains. Enwright started the original company in 1999 shortly after leaving the Republican Party of Florida (RPOF). Rimes joined him about a year later. “We have been working together essentially ever since,” Rimes says. Enwright has a long history in Republican politics and played a pivotal role in the 2000 presidential election recount that played out in Tallahassee where he was a senior adviser to James Baker. Both Enwright and Rimes are former executive directors of the RPOF, and Enwright also served as Regional Political Director for the Republican National Committee. Rimes has experience in politics and policy, having worked as a Deputy Chief of Staff for Gov. Charlie Crist and Staff Director in the Senate Majority Office under then-Senate President Don Gaetz and then-Majority Leader Lizbeth Benacquisto. Enwright Rimes Consulting will continue to provide government relations, as well as grassroots, political, digital and telemarketing services. They’ve long served AT&T, the U.S. Chamber Institute for Legal Reform and No Casinos. More recently, they’ve been advising the group behind Marsy’s Law for Florida, which aims to amend the Florida constitution with a crime victims’ bill of rights. The political shop now known as Election Management Solutions has won some big races, including Kathleen Passidomo, Jeff Brandes and Matt Gaetz. Their political skills were also important parts of the teams that helped Jeb Bush become governor and his brother George W. Bush become president. The team now advises, among others, the campaigns of Jay Fant for Attorney General, and Nick DiCeglie and David Smith for the Florida House, and they continue to help Matt Gaetz and Gus Bilirakis for Congress. Supernova is taking off, counting now-Congressman Gaetz, state Rep. Dane Eagle, state Sen. Jeff Brandes and state Sen. Dana Young as clients, boosting their respective online followings. Peter Schorsch is the President of Extensive Enterprises and is the publisher of some of Florida’s most influential new media websites, including SaintPetersBlog.com, Florida Politics, Orlando Rising and Sunburn, the morning read of what’s hot in Florida politics. Schorsch is also publisher of the quarterly INFLUENCE Magazine. For several years, SaintPetersBlog was ranked by the Washington Post as the best state-based blog in Florida. In addition to his publishing efforts, Peter is a political consultant to several of the state’s largest governmental affairs and public relations firms. Peter lives in St. Petersburg with his wife, Michelle, and their daughter, Ella.